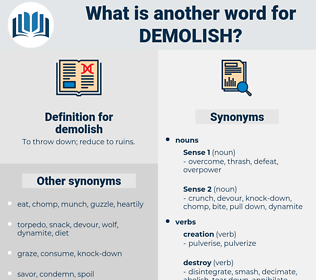 What is another word for demolish? To throw down; reduce to ruins. knocks props out from under. 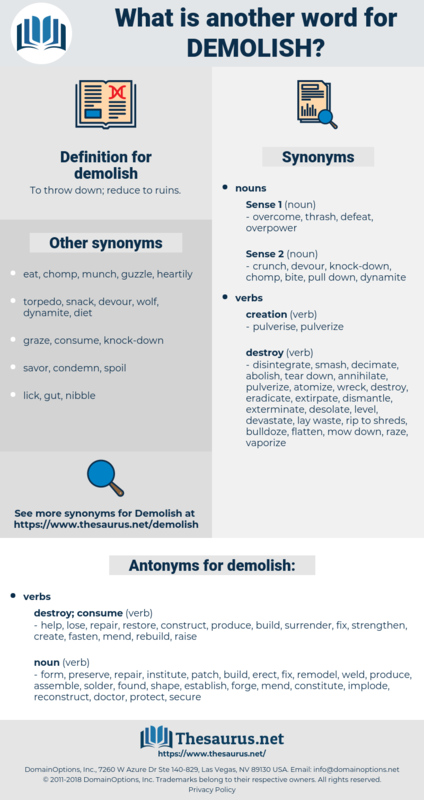 clobber, smash, obliterate, remove, decommission, undermine, scrap, topple, overturn, overthrow, eliminate, Eliminating, abolish, crush, ruin, annihilate, frustrate, spoil, disband, break, delete, tear, disrupt, sabotage, eradicate, wreck, undo, derail, dispose, shatter, erode, clearance, erase, torpedo, thwart. help, lose, repair, restore, construct, produce, build, surrender, fix, strengthen, create, fasten, mend, rebuild, raise. fashion, patch, doctor, preserve, mold, collapse, institute, protect, assemble, revamp, recondition, save, renovate, erect, constitute, attach, solder, bind, establish, renew, reconstruct, invent, join, found, implode, conserve, weld, shape, rear, secure, unite, frame, organize, father, remodel, form, forge. What struck me the most in all this splendor was that so much money should have been expended in furnishing a perishable wooden palace which any tuppenny earthquake or fire could demolish in a moment. Peterson's company had found a box full of Snider ammunition in one of the sangars, so the Kashmir Company was sent back to look for any more, and also to demolish the sangars.